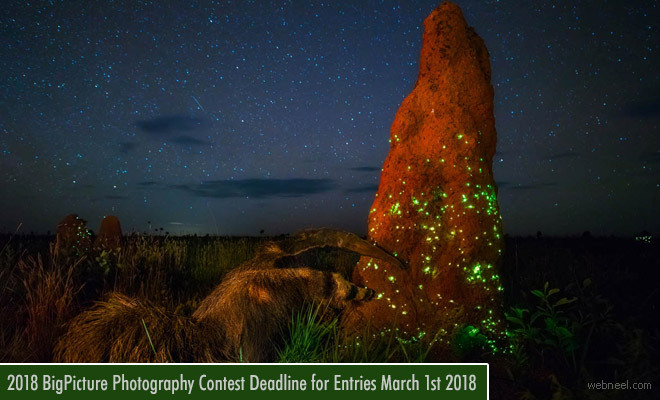 Photography contest : 2018 Big Picture Natural World Photography Competition is open to all photographers worldwide. Big Picture Photography is an annual photography contest and here is your chance to win total prize money $12,000. The grand prize winner receives $5000 as cash and the photographs will be exhibited at the California Academy of Sciences. The first place winners of the seven official categories will each receive $1,000 in cash and also have their winning images featured in the annual exhibit. Up to 6 additional finalists will be awarded a certificate of recognition for each category, with the exception of the Photo Series category. Entrants are limited to up to 10 single image submissions per registered email address and may register an unlimited number of email addresses. The deadline for submitting the entries is March 1st 2018. Image requirements: JPG format; sRGB; at least 1920 px on the longest dimension; no watermarks, borders or signatures. Winners will need to provide raw file.